Who do you call if you need a dead animal removal in Oregon City? If you are asking yourself that you have come to the right place. We handle all dead animal removal and pick up problems. The most common problem we called about is having a dead animal underneath a house in the crawl space. When this happens the odor comes up through the floor and puts off a horrible smell inside the house. This problem will only get worse the longer the animal is left underneath. The best thing to do is have the problem solved as soon as you notice it. Prevention is always the best method and this can be done by making sure your house is properly sealed up. BUT it is important to make sure animals are not under your house when your seal it off. This is the number one cause of dead animal removal in Oregon City that we get calls for. If you notice an entry point into the crawl space of your house we can make sure all animals are removed or out before sealing the entrance up to prevent the problem from happening. If you find a dead animal make sure you use proper safety equipment if touching it because there are dangerous health risks. Most of the time if you find a dead animal in your yard it could have died from some disease which would make it even more dangerous to humans, but pets and other wildlife as well. We are able to properly remove the dead animal, sanitize the area, and deodorize as well. Along with the health risks of having a dead animal the odor that can be left long after the animal is removed can be a big problem. We are able to deodorize under your house, inside, and in the attic with our professional deodorizing fogger. The deodorizer that we use is food grade which means it is child and pet safe. It also allows us to get into alot more places the chemical deodorizers can not get to safely. The longer the animal has been left in the house the longer the smell will last and it can stay around for months in some cases. 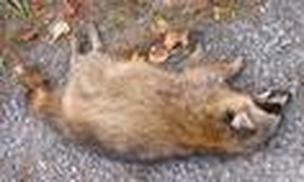 Oregon City Dead Animal Removal Call 503-201-2432!